You know what Berkeley needs? 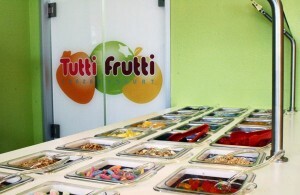 Well, it isn’t another frozen yogurt shop, but Tutti Frutti  opened about a week and a half ago all the same. The storefront is on Telegraph and the business model is eerily similar to another yogurt shop we could mention. We visited last week, and there were a few things worth noting. -The pomegranate flavor which, even though it was an unnatural pink color, was quite tasty. -The toppings included those stale mini-marshmallows, which reminded us of our childhood sundae-making days. -Also on the topic of toppings, there’s some mysterious jelly stuff in different flavors. We tried the lychee kind and weren’t crazy about it, but maybe it’s your thing. -It’s 29 cents an ounce, one cent per ounce less than Yogurtland … which adds up if you eat as much frozen yogurt as we do.